"Something yummy and easy to make. My mom makes these every New Year's Day. These fritters are best served immediately." Whisk pineapple, flour, milk, and egg together to form a light and fluffy batter. Bring reserved pineapple juice to a boil in a small saucepan. Add white sugar and stir to dissolve; lower heat. Simmer until thickened glaze forms, about 10 minutes. Remove from heat and cool to room temperature, about 15 minutes. Drop spoonfuls of batter in the hot oil, 2 to 3 pieces at a time, and fry until golden brown, 3 to 4 minutes. Drain on paper towels. 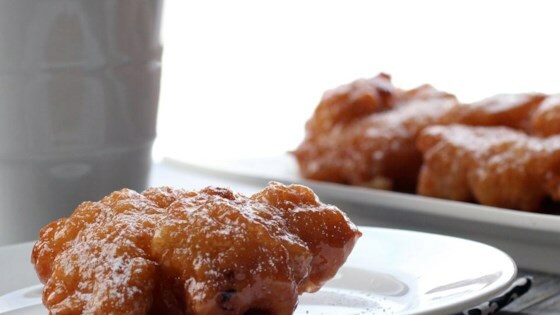 Drizzle glaze over fritters and dust with confectioners' sugar. I prefer to use skim milk in this recipe. Didn't cook all the way through. They turned out perfect!! I made them for a teacher luncheon at my kids school and everyone loved them, especially the pineapple glaze. This was an awesome recipe! Will make over and over. The kids really enjoyed them. It was very easy for them to bake. The youngest(6) poured and mixed the ingredients while the oldest (12) measured and made the glaze.